You might not think of yourself as a writer, but you are. Whether on social media, newsletters, or reports, writing is a part of your ministry life. What if improving as a writer allows you to communicate with friends, family, and co-workers more effectively? What if improving your writing is simpler—and more fun—than you remember from school days. Viral communicator, Amy Young is the perfect person to guide you through the maze. With encouragement, practical tips and plenty of humor, she shares all that she has learnt in her twenty plus years of writing and ministry. Available in Kindle and Print. Contact Amy to buy in bulk for your organization. Too often we believe that our stories don’t matter. They do. 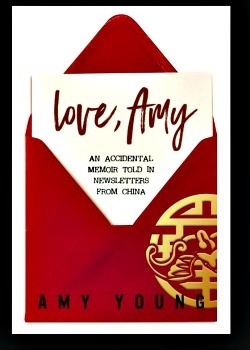 Love, Amy: An Accidental Memoir Told in Newsletters from China shows the power of a life story unfolding over time. Amy Young quit her job, packed up her belongings, and moved to China to teach English, initially for two years. She anticipated making cultural faux pas, trying new food, seeing God at work, and growing in her knowledge of language and culture. What she could not foresee, though, was nearly dying, experiencing political unrest, taking a job that involved traveling around China, training hundreds to live and minister in China, witnessing the craziness of SARS, or experiencing multiple medical situations. Join Amy, a natural storyteller, as she shares her life in China letter by letter. 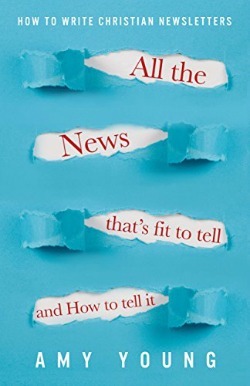 Bonus: Nine short articles to help those who write newsletters. and sanity intact during transition? This book is for those who will be going through a major life transition, either moving to the field or preparing to return to your ‘home’ country. Looming Transitionis on Amazon (both Kindle and print) and at Createspace. I earn slightly more if you buy a print copy at CreateSpace, but if you’ve got a good gig going on with Amazon, guilt-free buy from Amazon. 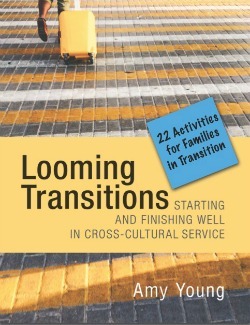 22 Activities for Families in Transition is a companion guide to Looming Transitions: Starting and Finishing Well in Cross-Cultural Service. It is available as a downloadable PDF for $5 or on Kindle for $2.99 (PDF and Kindle). The activities follows structure in Looming Transitions and are adaptable to the ages of your children. Know a family you could buy this for as a gift? 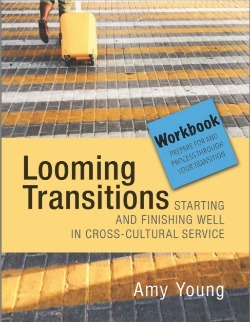 Looming Transitions Workbook is a companion guide to Looming Transitions: Starting and Finishing Well in Cross-Cultural Service. 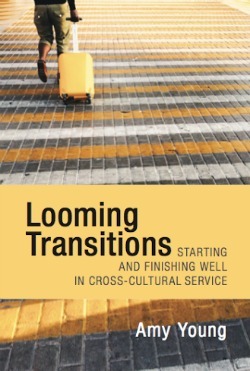 This PDF is designed to help you process through the material you read in Looming Transitions. You can print it off and fill it in by hand OR type your responses directly into the workbook. One of the pressing questions in Looming Transitions was: “How can you keep your soul fertile and your sanity intact during transition?” This workbook will help you do just that. Check out the multiple copy option where the more you buy, the cheaper the workbook is. You can leave a review on Amazon or Goodreads. Contact form for inquiries as to me speaking to your group about transitions, buying bulk orders, or your thoughts on the Broncos’ chances in the Superbowl.